The theme for this year’s National Non-Fiction November is ‘Food and Festivals Around the World’. I couldn’t help but jump onto the bandwagon with a look at Jewish festivals and their food, seeing as every festival has a distinctive and mainly yummy food associated with it. Shabbat falls every week on a Friday night and is the time for families to come together to share a meal. The food most associated with this is challah – a braided bread. 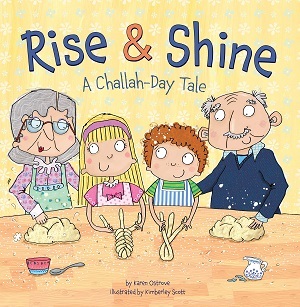 Rise and Shine: A Challah-Day Tale by Karen Ostrove, illustrated by Kimberly Scott, tells the tale of when Sammy and Sophie find a crumpled bit of paper in an old cooking apron but can’t read the writing. Their grandmother explains it’s a recipe in Yiddish for baking challah, and with the help of family members, they bake it in time for Shabbat. This sweet story exemplifies the importance of inter-generational activities, cultural inheritance, and of course the joy to be found in baking bread. You can buy it here. At the Jewish New Year, Rosh Hashana, it is customary to celebrate the wish for a sweet new year by eating sweet foods, in particular dipping apple in honey. This could also be tzimmes (typically a sweetened dish of carrots), or my favourite, the honey cake. Of course there’d be no honey without bees, and What’s the Buzz? 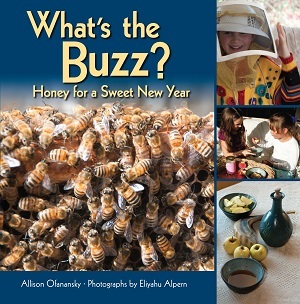 Honey for a Sweet New Year by Allison Maile Ofanansky, photographs by Eliyahu Alpern, takes the reader for a photographic tour around a bee farm, exploring how honey is extracted from the honeycomb and how a hive operates. A good non-fiction resource, there’s a fun fact section at the end. Hanukkah lasts for eight days, and is known as the Festival of Lights, but most children welcome it for its glut of doughnuts. Jewish people typically eat foods fried in oil, such as latkes and doughnuts, to celebrate the miracle of the oil lamp and the rededication of the temple in Jerusalem. However, it’s not krispy kremes but a special type of doughnut called sufganiot, which the Jewish bakeries sell. Gooey jam inside, sprinkles of sugar on the outside – these small round treats are light and fluffy. 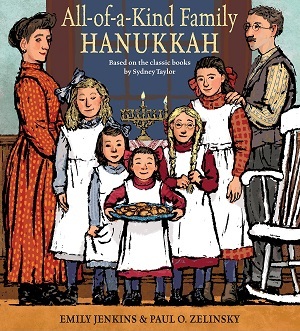 Just published this year, All-of-a-Kind Family Hanukkah by Emily Jenkins, illustrated by Paul O Zelinsky takes the All-of-a-Kind Family from the original book by Sydney Taylor, set at the turn of the last century in New York, and revisits them in 1912 in the tenements of the Lower East Side of NYC as Hanukkah approaches. This beautiful narrative gives a significance to the immigrant experience as it explores the sights and sounds of Jewish immigrant family, and shows how the cultural customs have lasted. You can buy it here. Purim is a popular holiday – a time of dressing up and play-acting and the retelling of the story of Esther, who saved the Jewish people in ancient Persia. The hamantaschen is the food of choice, a triangular-shaped pastry or biscuit filled with poppy seeds or jam (and nowadays even chocolate) that is said to represent the hat of the baddie in Esther’s story. Perhaps representation can feel a little thin in some Jewish children’s books. 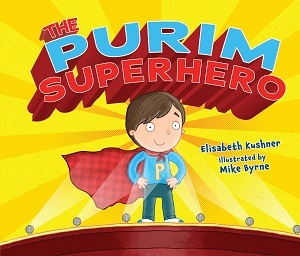 The Purim Superhero by Elisabeth Kushner, illustrated by Mike Byrne, focusses more on the costumes than the food of Purim, but strikes an important message for our times. Nate wants to dress as an alien for Purim but all his friends are going as superheroes. Taking inspiration from Esther, as well as from his two dads, he devises a super alien costume. This is a bright and happy picture book, which not only shows what a modern family does at Purim, but also features a non-traditional family. You can buy it here. In the spring, and hovering around the same time as Easter, is the Jewish festival of Passover. Celebrating the story of the Israelites fleeing Egypt (the Exodus), the narrative explains how they didn’t have enough time to bake bread for the journey, and so left with bread that wasn’t risen – matzah. Today, Jewish people celebrate with a whole selection of symbolic foods on the table during the telling of the story at the holiday meal – the seder. But matzah is always the first food that comes to mind, mainly because most people dislike the ‘cardboard’ like texture of the crackers. 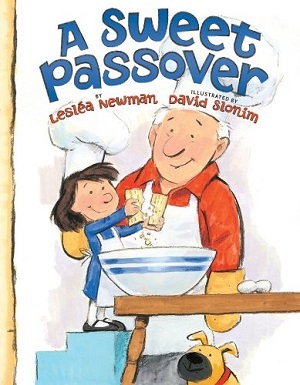 This sentiment is echoed by Miriam in A Sweet Passover by Leslea Newman, illustrated by David Slonim. By the last day of this eight-day festival, Miriam is “sick, sick, sick of matzah” despite having eaten it with a whole variety of spreads including chocolate, jam, cheese, tuna and egg. Her grandfather encourages her to try his matzah brie – like French toast but with matzah instead of bread. The book is almost as delicious as matzah brie itself, managing to slip in the exodus story and make insightful little comments too.